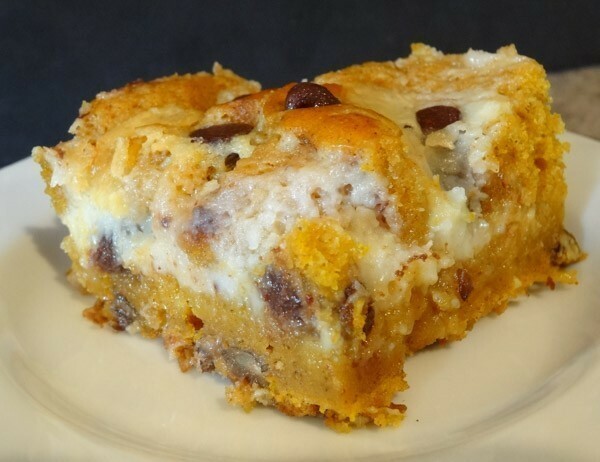 Pumpkin Earthquake Cake is a jazzed up cake mix with coconut, pecans, semisweet chocolate chips, and sweetened cream cheese infused into the batter. 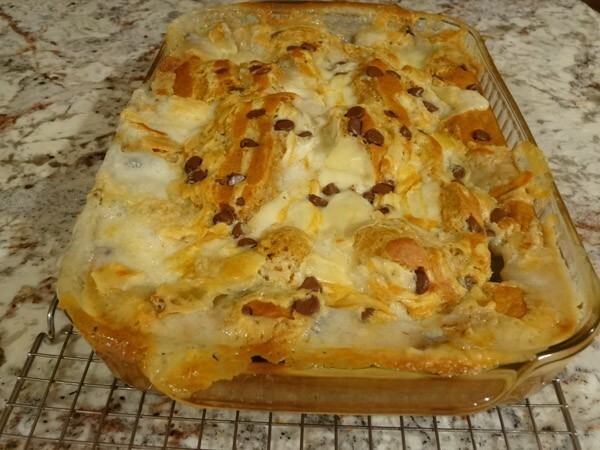 The addition of pumpkin and spices gives this dessert a great Fall flare. 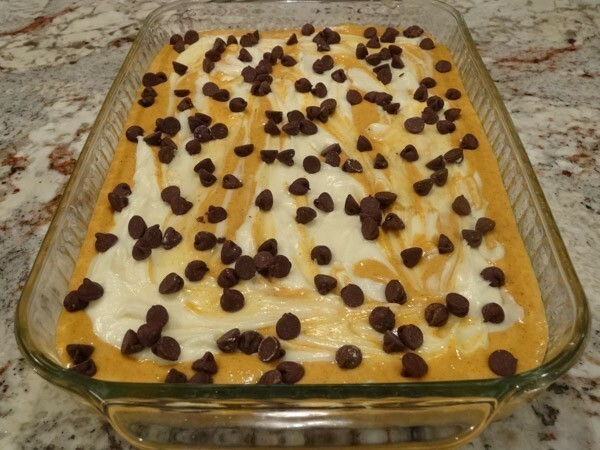 If you are a lover of pumpkin, you have got to try this dessert! This cake ends up being super moist and the combination of pumpkin and cream cheese, along with the toasted coconut and pecans turns this dessert into a real treat. Have you ever tried an Earthquake Cake? As the cake bakes with the cream cheese, little fissures and indentations form on the top, thus the name Earthquake Cake. Instead of using a chocolate cake mix for the regular Earthquake Cake, you end up using a white or yellow cake mix instead. 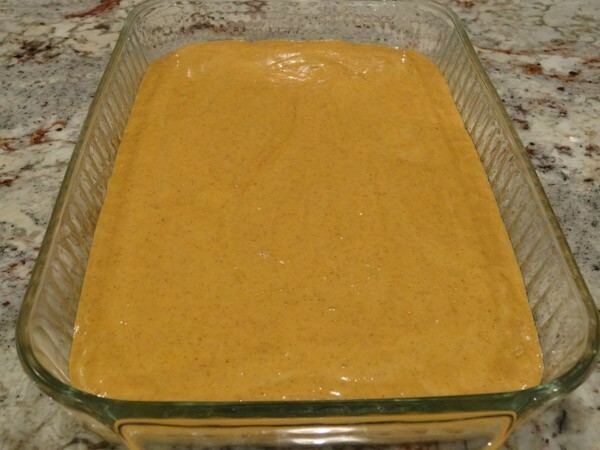 A cup of pumpkin puree along with cinnamon and pumpkin pie spice transforms this boxed cake mix into the Pumpkin Earthquake Cake. I was on the fence on whether or not the coconut and pecans should be included as a layer in this dessert, so I ended up trialing one version with and one without. I ended up liking the version with the coconut and pecans better. It just helps give this dessert a little extra pizzazz. I made a chocolate Earthquake Cake and learned a couple tips to pass along. Use softened butter instead of melted butter with the cream cheese; otherwise, the mixture practically absorbs into the cake. Start off by lightly greasing a 9 x 13 inch baking dish. Spread coconut evenly along bottom of pan followed by chopped pecans. In large bowl, add in cake mix, eggs, vegetable oil, and water. Make sure to follow oil and water recommendations I have listed instead of box directions. Blend with electric mixer on medium speed for 2 minutes. Add in one cup of canned pumpkin puree along with cinnamon and pumpkin spice. Blend until well-combined. Note: make sure to only add in a cup of pumpkin and not the whole 15 oz can. Spread cake batter over coconut/pecan layer. In another large bowl, add in softened cream cheese and butter. Blend with electric mixer on medium speed for 1 – 2 minutes. Add in powdered sugar, vanilla extract, and salt. Continue to blend until smooth in consistency. Note: in order to help prevent cake from overflowing, only use 2 to 2 1/2 cups of powdered sugar. Drop spoonfuls of cream cheese filling on top of cake batter and smooth out with spatula. Sprinkle semisweet chocolate chips evenly over cream cheese mixture. Place in oven on top of a cookie sheet and bake at 350 degrees F for 40 to 45 minutes or until toothpick inserted into cake portion comes out mostly clean. (I baked mine for 40 minutes). Note: a cookie sheet is highly recommended to catch any potential overflow. Cake rises and then settles as it cools. Remove pan to wire rack and allow to cool for at least 15 to 20 minutes. As the flavors meld together, this cake is even better the next day. Hope you get a chance to try and enjoy! 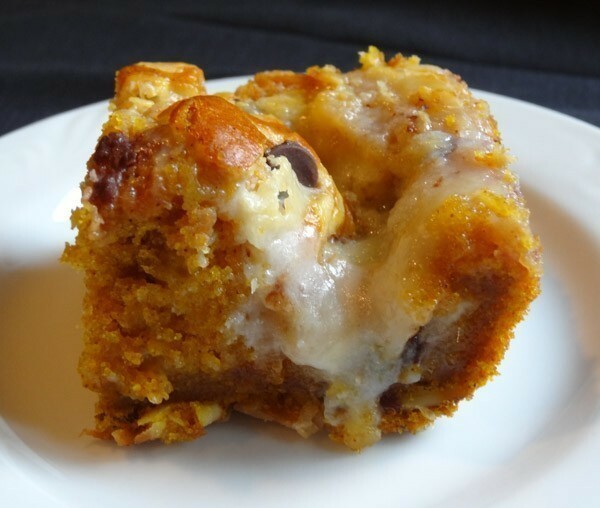 Pumpkin Earthquake Cake is a jazzed up cake mix with coconut, pecans, semisweet chocolate chips, and sweetened cream cheese infused in the batter. 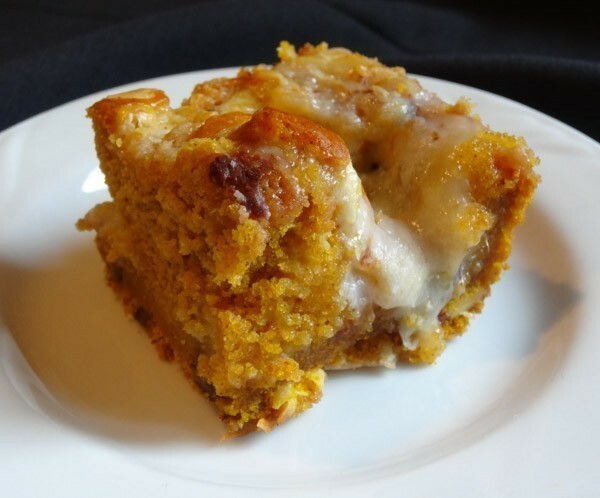 The addition of pumpkin and spices gives this dessert a great Fall flare. Lightly grease 9 x 13 inch baking dish. Preheat oven to 350 degrees F.
2. Spread coconut evenly along bottom of 9 x 13 inch baking dish. 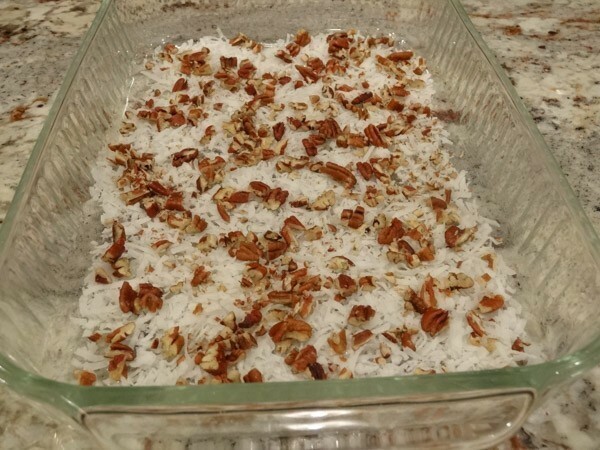 Sprinkle chopped pecans over coconut layer. 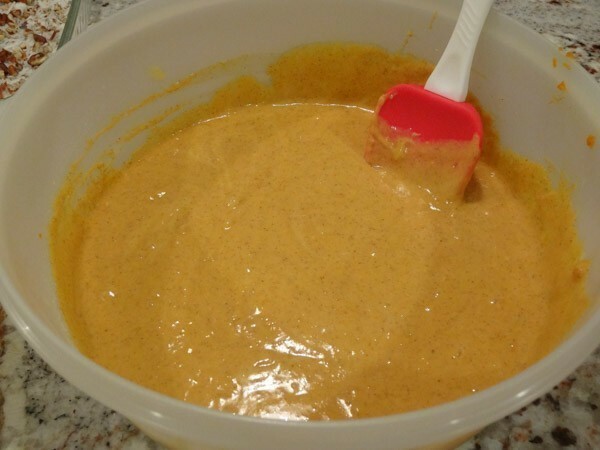 In large bowl, add in dry cake mix, eggs, 1/2 cup oil, and 3/4 cup water. Blend with electric mixer on medium speed for 2 minutes. 2. Add in pumpkin puree, pumpkin pie spice, and cinnamon. Blend with electric mixer until well-blended. 3. Pour cake batter over coconut and pecan layer. In large bowl, add softened cream cheese and butter. Blend with electric mixer on medium speed for 1 – 2 minutes. Add in powdered sugar, vanilla extract, and salt. Continue to blend until smooth in consistency. 2. 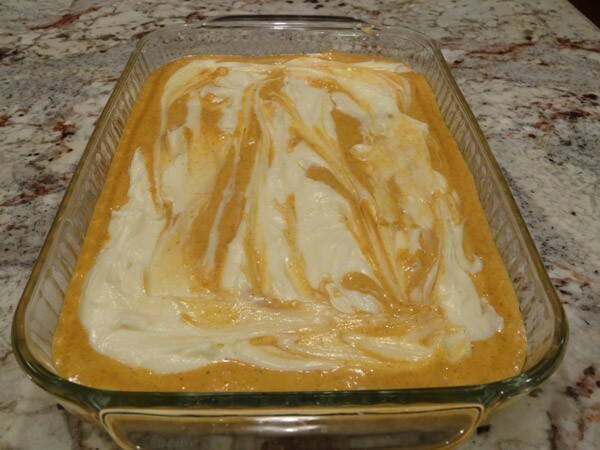 Spoon cream cheese mixture over cake batter. Spread with spatula if desired. 3. Sprinkle semisweet chocolate chips over cream cheese mixture. 4. Place cookie sheet on medium rack and place baking dish on top of cookie sheet. Bake at 350 degrees F for 40 to 45 minutes or until toothpick inserted into cake portion comes out mostly clean. 5. Remove pan to wire rack to cool for at least 15 to 20 minutes.